Do you have Native American ancestry? Or are you interested in Native American history? Then explore Fold3’s Native American Collection for free November 1-15. Ratified Indian Treaties (1722-1869): Ratified treaties that occurred between the United States government and American Indian tribes. Also included are presidential proclamations, correspondence, and treaty negotiation expenses. Indian Census Rolls (1885-1940): Census rolls submitted annually by agents or superintendents of Indian reservations as required by an 1884 Act of Congress. Only persons who maintained a formal affiliation with a tribe under Federal supervision are listed on these census rolls. Dawes Packets: Applications between 1896 and 1914 from members of the Cherokee, Creek, Choctaw, Chickasaw, and Seminole tribes to establish eligibility for an allotment of land in return for abolishing their tribal governments and recognizing Federal law. Dawes Enrollment Cards (1898-1914): Enrollment cards, also referred to as “census cards,” prepared by the staff of the Commission to the Five Civilized Tribes, commonly known as the Dawes Commission. The cards record information provided by applications submitted by members of the same family group or household and include notations of the actions taken. Eastern Cherokee Applications (1906-1909): Applications submitted for shares of the money that was appropriated for the Eastern Cherokee Indians by Congress on June 30, 1906. Enrollment of Eastern Cherokee by Guion Miller (1908-1910): The Guion Miller Roll is perhaps the most important source for Cherokee genealogical research. There are an estimated 90,000 individual applicants from throughout North America included within this publication. Cherokee Indian Agency, TN (1801-1835): The records of the agent of Indian Affairs in Tennessee, including correspondence, agency letter books, fiscal records, records of the Agent for the Department of War in Tennessee, records of the Agent for Cherokee Removal, and miscellaneous records. 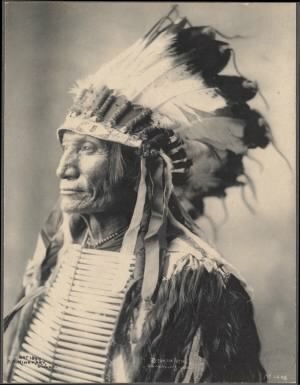 Rinehart Photos – Native Americans (1898): Photographs of over 100 Native Americans taken by Frank A. Rinehart, a commercial photographer in Omaha, Nebraska. Rinehart was commissioned to photograph the 1898 Indian Congress, part of the Trans-Mississippi International Exposition. Have you found an ancestor in Fold3’s Native American collection? Tell us about it! Or get started exploring the Native American Collection here. *Access to the records in the featured collections will be free until Nov 15, 2017 at 11:59 p.m. MT. Free access requires registration for a free Fold3 account. After the free access period ends, you will only be able to view the records in the featured collections using a paid Fold3 membership. Eli justice is my 3rd great grandfather and was a volunteer with Company D of Burke County, NC Volunteers for the Cherokee Indian Removal in May 1838. He supposedly had a son with a Cherokee woman and John G. Justice, my 2nd great grandfather is the result of that union. Elijah (Eli) was married later to Elmira A Patty Resoner and had 7 children with her. John G.Justice, my 2nd grandfather was said never in that household and possibly with his native american mother. Are there names of the Cherokee women that had children with white men (a marriage?) or a record of a child with his mother? Is there a way to look this up? My gggrandfather was Thomas J. Coleman from Wittiford and Union Counties in Kentucky. He married a woman named Johnson and after she died leaving him with eight children, he remarried Jane Dillon Maeks Coleman. Would like to know first name of first wife Johnson and her ethnicity, especially Cherokee blood and percent. While I was director of Charlton Park and Museum in Hastings, MI, the county bought the adjoining farm to double the park to 300 acres (with 1/2 mile of river and lake frontage). The first names on the abstract of deeds were two unpronounceable Indian names. The local tradition was that the neighbors bought this farm for the two Indians so they would not have to be removed to Oklahoma when Pres. Jackson defied the Supreme Court to remove all Indians from the eastern U.S. (Including the Cherokees who were better educated than their European neighbors, had their own written language, had legal white man’s titles to their lands and owned slaves on their plantations.) Many of the Indians in Michigan were hidden by their neighbors during Army sweeps to find them. My grandmother’s brief autobiography included a story of her mother being home alone in their Indiana back woods cabin when two Indians came by and asked for food. She fed them a meal and they continued on their way. A couple days later they came back on their way home and dropped off a deer. The Indian Pride movement had not begun in 1950 when I was in an Indian dancing group in Detroit. It was made up of teen age Boy Scouts, but not part of the Order of the Arrow. We learned many dances from various tribal groups around the country. We used 3 different costumes to go with the regional dances during each of our performances around the state . We had solo dances during costume changes. One was the eagle dance and one was a fire hoop dance by the only person in the group who looked Indian. He was of Philippine descent. 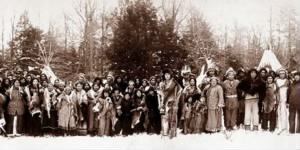 In the summer of 1950, there were no young Odowa Indians to do the dancing in their Harbor Springs, MI weekend pageant, except the princess and her court, who didn’t know Indian dancing. The tribe hired our Detroit Boy Scout group to do the Friday and Saturday evening pageants. We got a great kick out of the weekend. My wife and I have visited all 50 states at least once. We have visited many active and archaic Indian sites around the U.S. and Canada. We have watched hoop dance contests and local dance festivals. In buying pottery, we try to get a picture of the piece in the hands of the potter. I have a variety of native art and artifacts from Alaska, including an Easter 1959 weekend in Kotzebue, north of the Arctic Circle, a school year teaching on Fort Richardson, near Anchorage and a cruise up the coast with stops at Juneau, Ketchikan, Haines and Skagway. At 17, I hitch-hiked to Fairbanks on my way home to MI from a USFS job in Idaho in 1950. I forgot to mention, the park in Hastings, Michigan hosted weekend regional Indian Pow Wows and included a lot of Indian material in the Museum collections. It also hosted Civil War reenactments and cannon target shoots. On the steam rodeo weekends, the noon whistle blow by all the steam tractors, engines and mills could be heard 3 miles away in town.